It’s biryani but it’s cooked in a bamboo. And it’s all kinds of yum. 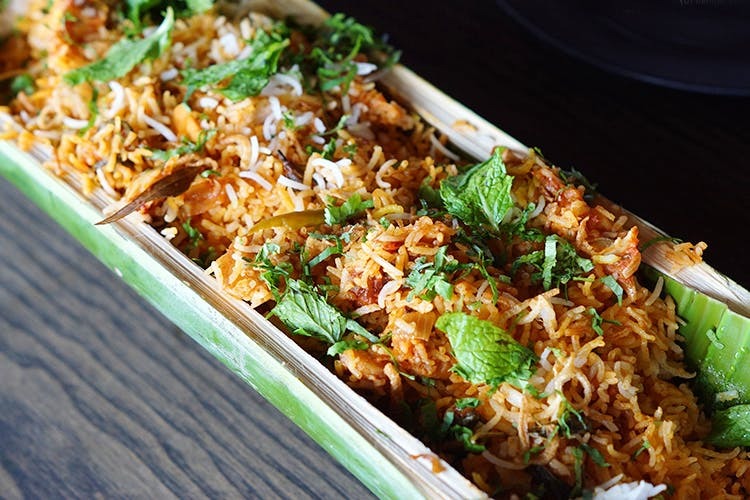 Let your tummy feast on Broadway — The Gourmet Theater’s three kinds of bamboo biryani. We have tried almost all kinds of biryanis including the popular donnes, dums, and Malabari varieties. But a bamboo biryani is something we haven’t tried yet. And finally we did and we liked it. Basically, it’s biryani that’s cooked in a foot long-ish bamboo that’s been sealed on end with maida. Available in three varieties — vegetarian, chicken, and mutton — the biryanis are must-have especially if you are on a crusade to try the every kind of biryani there is. Coming to the flavour, the biryanis have a spicy kick as well as a slightly smokey flavour. Not the masala spice that overpowers everything, but the kind that goes well with the raita served on the side. The foot-long bamboo can be easily shared between two people, but if you are like us who don’t really share food, then you’re sorted till your next meal time. The vegetarian biryani is priced at INR 300, while the chicken and mutton come at INR 350 and INR 400 respectively. See the prices are quite reasonable too and plus you get to enjoy some fine-dining experience while you are at it. Oh, and have you tried beer with biryani? Well, here’s your chance to try it as the restaurant serves alcohol too. In fact, you’ll be surprised to see that the main attraction of the place is the teppanyaki section and a big menu dedicated to unusual South East Asian cuisine. You can read about our teppanyaki experience here. We had attended an invite-only bamboo biryani event organised by the Bengaluru Biriyani Club at Broadway and the featured image is from the same event where biryani was served in a six-foot long bamboo.